It’s been a week since I’ve launched this blog and posted my list of favourite software and hardware tools for research, note-taking, outlining, writing and other aspects of personal information management and productivity. 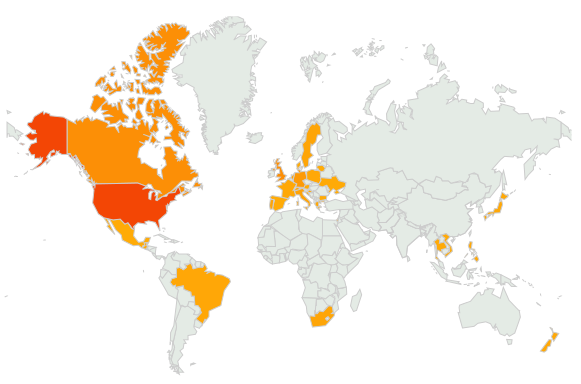 About 70% of the visitors came from the Outliner Software forum, so the following stats may also give a quick snapshot of which countries readers of Outliner Software are based in and what software that was discussed here they were most interested in. It’s understandable that CT and Amode were top of the list, considering that I have reviewed both in dedicated posts. I’m happy that Protopage has made it to no. 3, as I’ve been a long-time fan and user and I can’t imagine my life without it. (Apparently there is even a way to embed your Google Calendar into Protopage – although I haven’t tried it.) There are two one-trick ponies on the list: A-PDF Collector and PureText. I use PureText several times daily, pretty much every time I am doing copying and pasting. A-PDF Collector is a more occasionally used tool but can be very useful for the specific job it does. Debenu PDF Maximus is the one software I use the least frequently, simply because those big jobs it’s designed for don’t come along that frequently. It’s quite expensive as well, though I was able to grab a free copy at the ever so useful BitsduJour service. In my top 10 I would have probably also included other iPhone/iPod Touch/iPad apps such as iThoughts, GoodReader and PDF Expert.